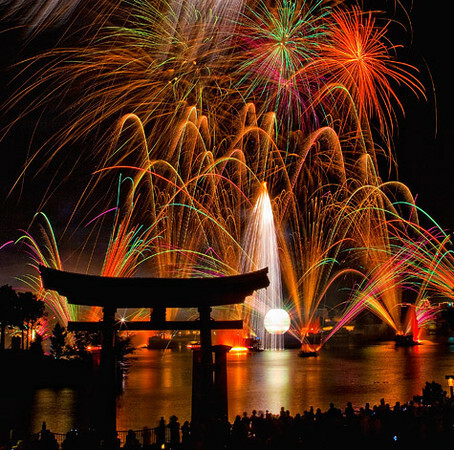 My friends at the Disney Photography Blog have released an eBook called Fireworks Photography. The 55-page eBook is something I wished I had when I started to photograph fireworks. It would have saved me much time and money as it took three trips to Walt Disney World before I figured out how to get good photographs of Illuminations in Epcot and Wishes in the Magic Kingdom. 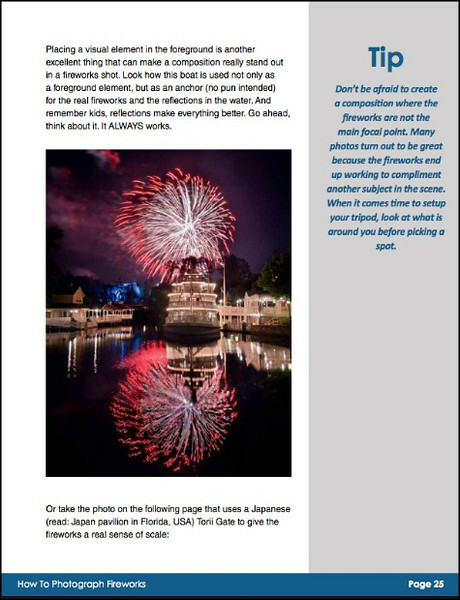 The last chapter goes into how to process firework shots to get the results you see in Disney brochures. They go step by step using instructions which can be used for many popular photo editing software programs like Adobe PhotoShop Elements, PhotoShop, LightRoom, Apple Aperture 3 and many others. You will see how to maintain detail in the fireworks while keeping all the bright colors you remember seeing in the shows. In other words, you will “Wow” your friends and family both at home and online. I know what you are thinking. Between this blog and many other websites, you could find all this information for free instead of purchasing Fireworks Photography at its current introductory price of $14US. Ebooks are good for a couple of reasons. One, you can put them on your smartphones, tablets, netbooks and laptops and have access to all their information without needing an Internet connection. Two, the topic of the eBook (in this case, fireworks photography) is laid out in one place with examples, details, suggestions and ideas by the authors who are experts. They have done all the searching, researching and compiling for you as well as passing on their knowledge and experience. In many cases, it is far easier and less time consuming for me than doing all the work myself. Well worth the money in my opinion. This entry was posted in Photography, Travel and tagged ebook, epcot, filters, fireworks, illuminations, long exposures, magic kingdom, neutral density, tripod, walt disney world. Bookmark the permalink. Wow, 55 pages on photographing foreworks? I didn’t think there was THAT much to it! Does it get really technical? Many pages are similar to the one I shared in the article with inspirational photos to get you psyched for taking fireworks. It’s a good read and excellent resource. In some places, it does get technical as one does need to understand the basic exposure principles and techniques of photographing firework displays from small local shows to hugs ones like Disney puts on every night. They encourage experimenting and practice. This is an excellent eBook for anyone who has never tried fireworks photography before and for those who have and got discouraged with their results. Hee hee…well, it’s not like I wasn’t going anyway but I sure would have gotten better results faster if I had an eBook like this to learn from. That’s what I used to do. Local shows are tough as they usually are not in a setting with good foreground objects. Sometimes, it’s go to get way back and include more for local shows like rivers, skylines, etc. This month I will – finally – purchase a DSLR camera 🙂 – it would be fun to celebrate this with fireworks (-photos)! Oh, how exciting! Well, you’ll need a tripod for fireworks or a bean bag and a place to rest the camera at the least.